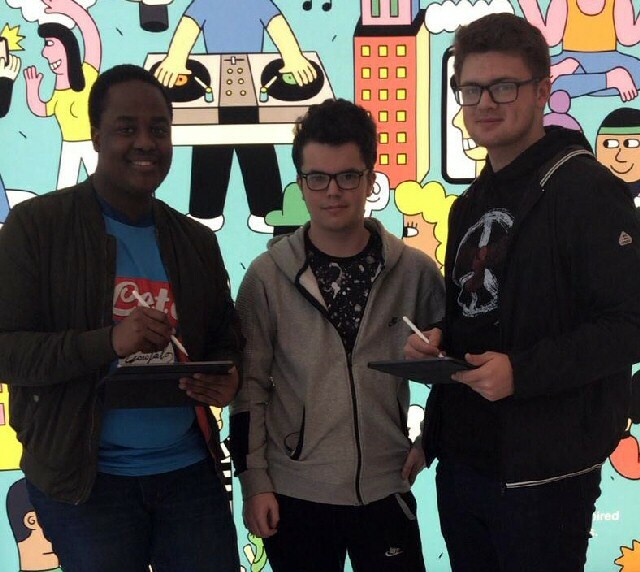 HUGH Baird College Level 3 BTEC Business students were recently treated to an insight into how the creative team at Apple's Liverpool 1 store develop and create apps. The students were shown how the design cycle works and the different issues that should be considered when creating and maintaining an app. The session also included the stories of 4 app creators who made successful apps that are making a difference in their communities. 2 apps that stood out to the students were:- 'What's Up' and 'Be My Eyes.' These were both apps that help tackle prominent issues in today's society such as mental health and support for the blind / low vision. Christopher Norris, Hugh Baird College BTEC Business Tutor, said:- "The students got to demonstrate what they knew about innovation and how businesses can become successful by looking for gaps in the market. Hopefully this will inspire them to go onto develop their own unique business ideas in the future and contribute to the local economy. A big thanks to Apple for hosting the event and sharing their vast knowledge with our students." Takudzwa Ruzive, Hugh Baird College BTEC Business student, said:- "I found the trip to the Liverpool 1 Apple store very interesting. The session opened my eyes to the different opportunities to make a difference that studying Business can give you. I really enjoyed it!" For more information on BTEC Business courses, please visit:- HughBaird.AC.UK or call:- 0151 353 4444. DETECTIVES from the North West Regional Organised Crime Unit (NWROCU) have welcomed the sentencing of a 58 year old man after he was convicted for his role following a drugs operation targeting those suspected of supplying drugs in Merseyside. John Grace, 58, of Waresley Crescent, Liverpool was sentenced to 12 years behind bars. Grace, who was a Registered Taxi Driver, was also the head of an Organised Crime Group supplying Class A drugs in Merseyside. He was arrested, on 11 January 2018, following a seizure in Widnes, Cheshire that also recovered 4 kilos of cocaine with a street value in excess of ₤60,000. Detective Inspector Nick Hughes said:- "We're committed to taking dangerous substances as well as dangerous people off our streets. The sentencing of Grace is a result of a long running and complex operation in relation to suspected heroin and cocaine supply and money laundering offences, which we have been investigating since May 2017. We'll continue, with the support of Police forces across the North West and beyond, to target those suspected of being involved in the supply and distribution of drugs, and put them before the courts. Drug dealers often only think of themselves and their financial gain, not thinking of the ripple effects these substances have on those who use drugs, their families and friends. We want Merseyside to be a safe and secure county. I would encourage the public to report those involved in supplying drugs. If you suspect drug dealers to be operating in your area, via Crimestoppers UK, on:- 0800 555 111 so we can investigate accordingly." ORGANISATIONS across Merseyside are being encouraged to help break the cycle of domestic abuse by joining a new scheme which will equip employers with the skills to help support their staff. Merseyside's Police Commissioner Jane Kennedy, on Thursday, 11 April 2019, launched the Merseyside Domestic Abuse Workplace scheme in partnership with the Region's Metro Mayor, Steve Rotheram, at an event at his offices, located on Mann Island. The initiative has been launched to give employers the tools, resources and training to respond when a member of staff is at risk of domestic abuse. 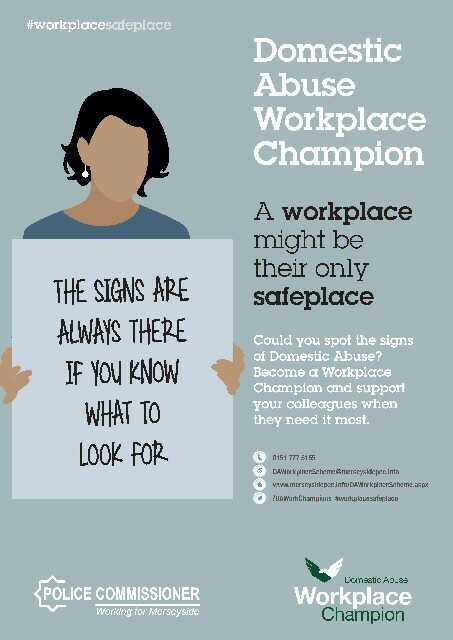 This includes helping employers to provide a safe space where staff affected by domestic abuse can talk confidentially, via a network of trained volunteer:- 'Champions,' who will ensure vulnerable colleagues are signposted to support when they need it most. Businesses that sign up to the initiative will have designated members of staff who volunteer to become:- 'Workplace Champions' helping to spot the signs of possible abuse and providing advice, offer support and ensure victims are directed to outreach workers or specialist support where needed. Jane said:- "Domestic Abuse has a profound effect on families at home, but it also costs businesses ₤1.9billion every year in decreased productivity, time off work and sick pay. Domestic abuse is everyone's business and that's why I am encouraging employers; small and large, public and private; to sign up to join this initiative. For some people, work may be the only safe place they have from abuse and violence and it is important that employers recognise and understand the hugely important role they can have in helping someone who may be suffering. 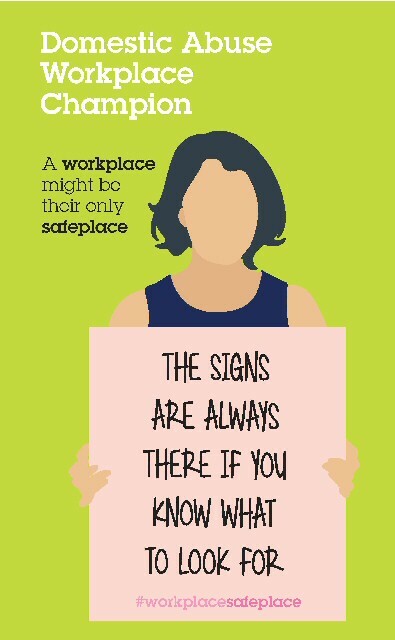 By having a safe space within work, safe domestic abuse policies and properly trained 'Champions' who are able to listen and provide the right support and guidance to a vulnerable individual, that employer is in a unique position to potentially help a victim to take those all important 1st steps in breaking the cycle of abuse. I would encourage employers who are committed to staff welfare and well being and who are interested in finding out more, to register to attend this event." Steve Rotheram, Metro Mayor of the Liverpool City Region said:- "Domestic abuse is a devastating crime that affects millions of people in England and Wales each year but, all too often, it is a crime that goes unreported. The Workplace Champion Scheme will build upon some of the brilliant work being done across the Region to raise awareness of domestic abuse and support victims, and survivors, to get the help they need. We hope that by giving employers the tools, resources and training to respond when a member of staff is at risk of domestic abuse we will be able to support vulnerable people in the work place." To reserve your place or to find out more, please you need to send an email to:- Info@LiverpoolCityRegion-CA.Gov.UK. A Merseyside Police spokesman this week have said that:- "Merseyside Police is currently investigating the publication of a number of offensive Tweets made in relation to a Liverpool footballer. The language used in the Tweets is abhorrent and we are taking the reports extremely seriously. Detectives from Merseyside Police are linking in with the Metropolitan Police Service in relation to the latest Tweet and we understand a number of individuals who are currently in Prague for the Slavia Prague V Chelsea Champions League game have been identified and have had their match tickets rescinded for this evening's fixture. We will continue to work with Liverpool Football Club to ensure that those who use the Internet to target others, and who commit criminal offences such as harassment or hate crime in doing so, understand that they are not beyond the law."